Tom Engelhardt tackles our military fetish in The American Way of War. Except a Homeland Security State has always been stuck in the American subconscious; it just experienced a coming-out after 9/11. 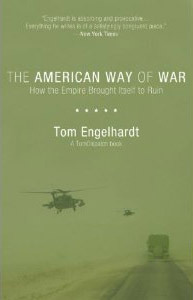 In this pithy collection of essays, Engelhardt—cofounder of the American Empire Project and the Nation Institute-sponsored blog TomDispatch—charts the long history of America’s obsession with war. Beyond the Bush administration’s expanded US military agenda, militarism and its trappings have been ingrained in the American psyche for decades. “That’s why, for all the shock, it was, in a sense, so familiar,” he writes. “Americans were already imagining versions of September 11 soon after the dropping of the first atomic bomb on Hiroshima on August 6, 1945.” Hollywood-generated apocalypses from The Towering Inferno to Independence Day had set a cultural precedent for visions of widespread manmade disaster. The Bush administration only seized on that vision to fuel its own version of reality. Those preparations are tracked in Engelhardt’s book in alarming detail. In “How to Garrison a Planet,” he investigates a Pentagon “lily pad strategy” of dropping bases everywhere the United States anticipates war. Embassies aside—he balks at the $592 million, 104-acre US embassy in Baghdad’s Green Zone in the mordant “Wonders of the Imperial World”—there are at least seven hundred American military and intelligence bases scattered across the globe. The Pentagon’s budget has increased on Barack Obama’s watch, and according to Engelhardt, within the next two years we will see “near-Vietnam-level escalation rates” in Afghanistan. The president who campaigned to end the Iraq War, he writes, has conceded to the generals who advocate this other “necessary” war. In an epilogue wryly titled “Premature Withdrawal,” Engelhardt condemns pundits and strategists who keep the Warspeak machine in motion. “What, of course, makes their arguments particularly potent is the fact that they base them almost entirely on things that have yet to happen, that may, in fact, never happen,” he writes. Engelhardt himself has been working for years to deflate such fantasies on TomDispatch, from which these essays were culled. In his latest book, as in his daily dispatches, he takes on our war-possessed world with clear-eyed, penetrating precision.